Vacuum Brazed Technology™ fused to steel core for protection, durability and heat resistance. Designed to be used on a variety of materials. 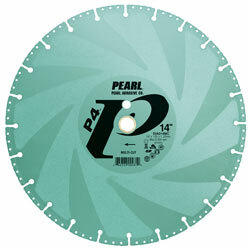 12" to 16" blades have diamond electroplated side protection which protects the core, reduces heat and prevents binding. Application: For Metal Studs, Ductile Iron, Concrete, Asphalt, Masonry, Steel, Stainless Steel, Aluminum, Stucco, Tile Backer Board, Roof Tile, Corrugated Roofing, PVC, Plastic, Wood, Pipe, Dry Wall, Rebar.